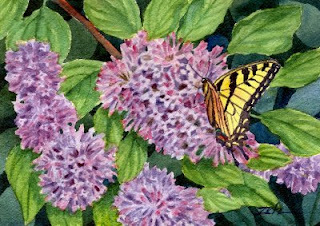 Though the Tiger Swallowtail butterflies emerge from their winter cocoons about the time the lilacs are blooming, this particular lilac blooms a bit later after other lilacs have stopped blooming. But there are still enough of these lovely creatures flitting around to frequent this lilac which has a strong spicy sweet scent. The Miss Kim lilac grows slowly and never becomes as large a shrub as other lilacs so its a good one to fill a small space. The mail carrier tells me that she can smell the lilacs from the road 200 feet away when she delivers mail to my rural mailbox. Pretty powerful for one small shrub!